Location-based apps that recommend nearby people to connect with were widely tipped to take off at SXSW this year. While that didn’t quite happen, the hype around startups like Highlight and Glancee certainly created a surge in interest around this nascent genre of app. 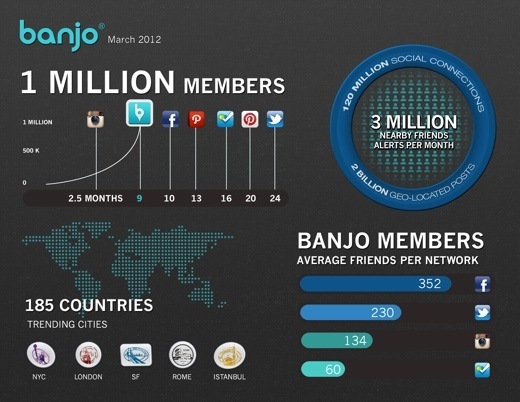 Witness Banjo – which has today announced that it has passed the one million user mark. 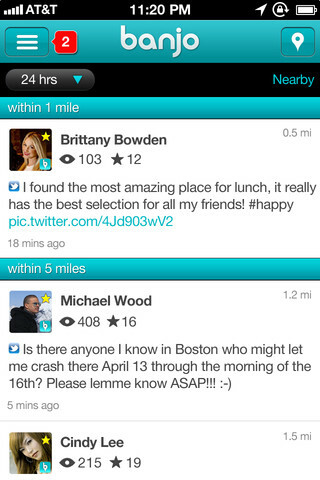 Launched nine months ago, Banjo alerts users when friends have checked in nearby using services like Facebook or Foursquare. 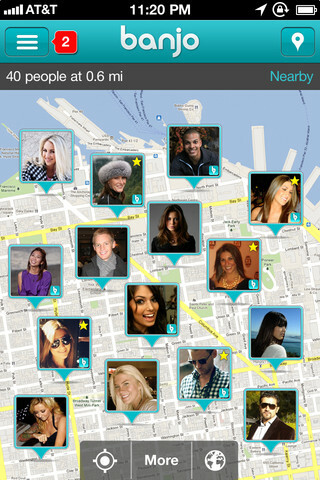 Additionally, you can view current public checkins, and geotagged tweets and Instagram photos on a map, allowing you to get a feel for social activity in your local area or anywhere in the world. The iOS and Android app is arguably less ‘creepy’ than the likes of Highlight, as it relies on check-ins shared by your friends, or by others who have opted to make their check-ins public. That said, it’s more of a social media-powered location browser than a friend recommendation service like Highlight, which alerts you when other users with similar interests are nearby. Sitting on the bridge between the two approaches is Sonar, which relies on common location check-ins to make recommendations. It’s too soon to see which approach (if any) will win the affections of a mainstream audience, but Banjo certainly seems to have got off to a strong start. That said, its closest rivals haven’t announced any user numbers to date.